6 x 8 Post-it® Notes. Full color printing. Pads of 50. Great for Realtors. Great for Realtors to stick to front doors with no damage to the door. 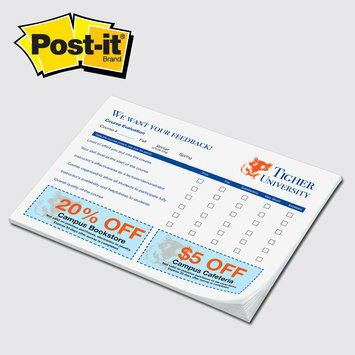 The low cost option —same great Post-it® Brand promise, service and delivery. Printing with process inks keeps it simple and saves money! BIG notes for BIG impact — ideal for forms, lists, surveys, ads, coupons, calendars, menus and more! Requests calling for a specific PMS color will be converted to the closest possible 4-color process match. Exact match cannot be guaranteed. No fluorescent, special mix or metallic inks. If color match is critical, call us at 602.482.1142.